Newborough Forest is facing devastation! Have these proposals been thought through? Who owns the Forest ? What is the EU Habitats Directive ? 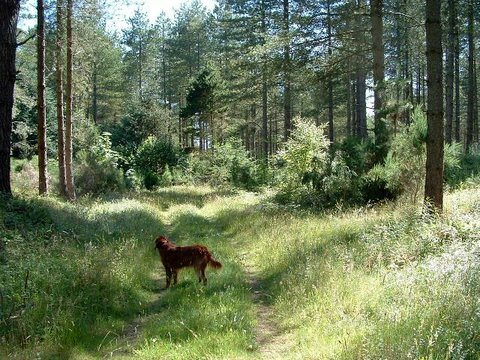 Newborough forest is the only large open access woodland (700 hectares) on Anglesey. It is the islands best outdoor leisure centre enjoyed by walkers, horseriders, cyclists, and people just out for a stroll in the fresh air. This woodland is a very important amenity with a diverse range of visitors (over 200,000 annually). People visit all year round to take advantage of the shelter it provides: shade in the summer and mostimportantly allowing access in our often inclement weather providing shelter from rain and freezing winter winds. It is very important for the island’s tourism (worth £100m to the island economy). More people visit forests in a year than visit a beach and after a picnic lunch they go into the forest for the remainder of their day out. The UK and Welsh Governments are very keen for people to get outside in the fresh air for exercise. It is very important for the population's health and wellbeing and Newborough forest is ideal, a place of peace and tranquility where people can get away from all the stress of modern life. The forest was planted between 1947 - 1965 to stabilise the dunes which have historically posed a threat to Newborough village and the surrounding farm land. It has developed into what is essentially a beautiful 'Dune Woodland', with a rich under-storey of native trees, vegetation & associated wildlife. There is a very important Raven roost, the second largest in Western Europe (some 2000 birds). This Raven Roost was on the BBC programme 'Spring Watch' recently and Wildlife Presenter Simon King was in the forest for quite a few days. It is also a refuge for the protected native Red Squirrel. Anglesey is to become a stronghold for this little endangered animal, and over a period of time it is hoped that they will spread all over the island with strategic planting etc. The re-introduction of red squirrels was initially supported under EU economic stimulus funding, the Objective One programme; supported by WAG, local government and the then national conservation agency, CCW. Subsequently the project has been supported via GrantScape and indirectly from WAG/CCW through the North Wales Wildlife Trust. We now have a scenario where having used EU and UK funds to support the development of a thriving red squirrel population at Newborough CCW now wish to destroy substantial areas of forest habitat that this native endangered animal depends on. 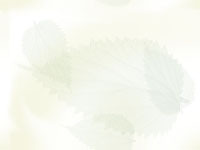 The forest is owned by Welsh Assembly Government and held in trust by the Assembly on behalf of 'the people of Wales'. It does NOT belong to Natural Resources Wales (NRW). In other words, it is YOUR forest (see - Newborough News). Newborough forest has a large dune area to the east called Newborough Warren and mobile dunes around the forest/beach boundary. The Countryside Council for Wales (CCW) have claimed but failed to substantiate that the forest is having an adverse impact on the dune area. 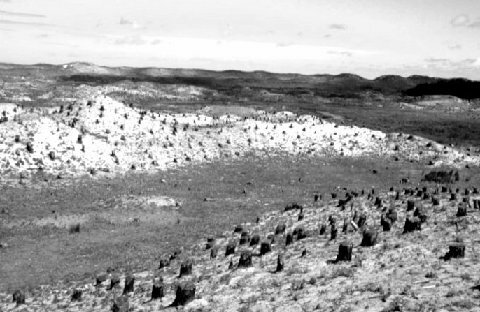 The forest & dunes have co-existed in harmony for well over 60 years and evidence of harm to the dune system would appear to be in short supply. In fact in 2002, when the Special Area of Conservation (SAC) was set up, the dunes were deemed to be in ‘excellent or good conservation status’ according to documentation sent to the EU. CCW’s monitoring of the dunes in 2005 also found the dunes were in favourable condition but now they claim they are not. The CCW wanted to remove at least 40% of the forest clear felling a 0.5km swathe of woodland around the forest/beach boundary and along the forest/Warren edge. In doing so they would destroy one of the most important attractions to the visitor - the intimate link between the beach and forest. Newborough is a coastal forest and being able to step off the beach into the shelter of the forest while still enjoyingthe seascapes and beach is a key attraction to visitors. The CCW/FCW justification for this action was that it is required in order for the management of the forest to comply with the European Habitats Directive. They also claim that unless we demonstrate that action is being taken to improve the condition of the sand dunes, there is a risk that the EU may impose penalties on the government. However this is nonsense ( see also - What the CCW & FCW say). The Directive requires that the protected dunes are kept in favourable condition and that their area should be stable and not declining. There is no requirement or remit in the Directive to expand the area of dunes and in doing so try to turn the clock back to the 1940s. CCW’s own monitoring of the dunes shows they are in favourable condition and there is no decline in their area so the EU has no reason to consider legal action against WAG. Such action would only be contemplated if WAG & CCW were clearly failing to fulfill their obligations to protect the dunes. This is not the case. In addition, this same European Habitats Directive also requires that 'social, economic & cultural' benefits are taken into account when planning conservation measures (see - What is the EU Habitats Directive). To date neither the social, economic or climate change implications of CCW’s plans have been given the consideration they require. The CCW lacked the expertise to properly consider these aspects of the wider public interest. It currently seems that the wishes of forest visitors & the interests of the Anglesey tourism industry are being ignored. This makes the current CCW recommendations seriously flawed! CCW have also failed to consider whether or not the car parks & access drives can exist for long in the presence of 'mobile sand dunes' ? It is surely only because of the forest stabilising the sand dunes since the 1950's that it has been possible to create the car parks & access drives so close to the beach. The CCW were insisting that to meet the EU Habitat Directive, a minimum 500 m, 1/2 km or 1/3rd mile strip, around the forest/beach boundary and along the dune side of the forest should be clear felled (see - TSG FDP document). This would remove ALL of the forest around the 2 main beach car parks & along both sides of the track leading to LLandwyn island. This would fully expose the southern end of the forest to the strong SW prevailing winds. 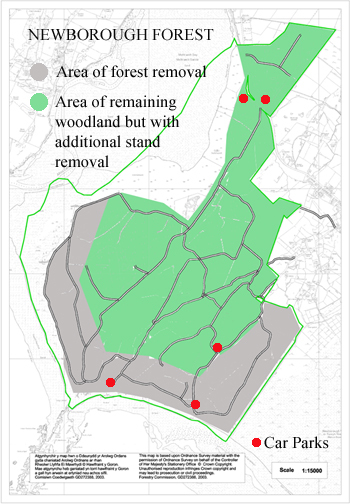 The area it is proposed to clear is the very area where the vast majority of people walk when visiting Newborough forest. These trees provide people with shelter from wind and rain, allowing access in our often poor weather conditions and provide shade in the summer. In addition these trees form a shelter-belt for the rest of the Forest. Without this shelter-belt, the previously sheltered trees at the edge of the remaining forest would soon fall in the winter storms. The extent of this windthrow damage to the forest is unknown but would be significant. They also wish to remove tree stumps to create 'mobile sand dunes'. In no time at all, the mobile sand dunes created would be likely to cover the access roads & car parks, making access to the car parks & LLandwyn island difficult if not impossible. The creation of a wide dune area between the forest and beach would also disenfranchise the less mobile: the infirm, disabled and those with young children & buggies. Only the most active can move through a dune landscape. Should those of limited mobility be disenfranchised and no longer be able to enjoy the sea and beach from the shelter of the forest paths and drives. This forest is also part of the Anglesey coastal 'Area of Outstanding Natural Beauty' (AONB). These proposals would greatly reduce the recreational value of the Forest. Anglesey would lose its best & most popular (over 200,000 visitors annually) outdoor leisure area. They would damage the potential to develop the tourism value of the site & significantly reduce the islands tourism income. They would also be a serious blow to local red squirrel conservation work. We need all the help we can get to inform the general public about what the CCW, the national conservation agency, plan for this lovely area, and we all would very much appreciate it if you could spread the word.